This book explores 1 Peter against the backdrop of apocalyptic thought within early Judaism and Christianity, especially the concept of messianic woes (an expectation that a period of suffering and tribulation would preface the coming of the Messiah). 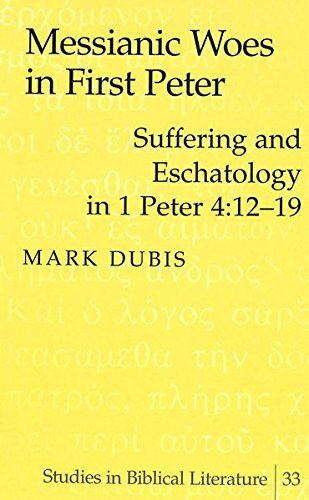 It focuses upon 1 Peter’s most eschatologically charged passage, 4:12-19, and argues that the messianic woes pattern shapes both this pericope as well as the book as a whole. The Author: Mark Dubis is Assistant Professor of Christian Scriptures at The George W. Truett Theological Seminary of Baylor University in Waco, Texas. He received his Ph.D. in biblical studies from Union Theological Seminary in Virginia.